As many of you know, this summer I have been recovering from an operation. I am doing really well now and almost back to normal. I want to thank you all for your kind wishes over the past months. Unfortunately, my painting has been sadly neglected during this time but I can feel the stirrings of inspiration starting again and the autumn colours are tempting me out to sketch. Fortuitously, only a week ago, I was invited by Cox & Kings to take part in their Morocco Art competition along with four other artists and this has given me the impetus I need to get painting again. I travelled to Morocco with David in 1993 and was captivated by the sumptuous colour in Marrakesh, the fascinating culture of the Berber tribes, the architecture, from Mosaic Palaces to mud brick dwellings, and the magnificent mountain scenery of the Atlas Mountains. Really looking forward to a chance to win one of Cox & Kings’ Morocco holidays. So where to begin? 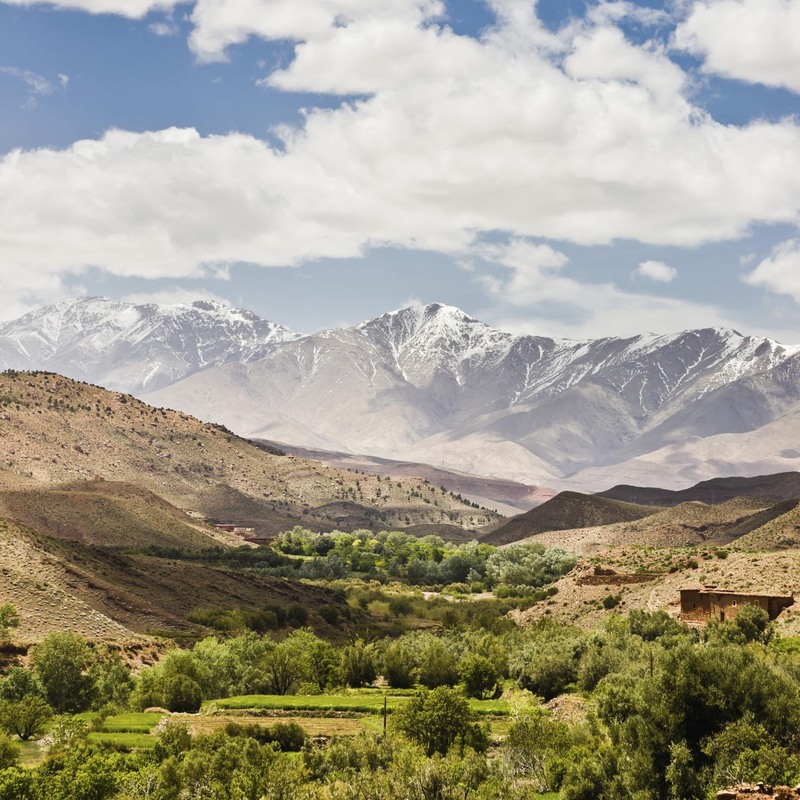 I have chosen the scene below of the Atlas Mountains with a scattering of buildings. The first step is to start planning my treatment of the subject. My initial thoughts are that the atmosphere and colour of the photograph below will hardly need any adjustment but I want to bring the low building on the right more towards the centre of the painting to make a more satisfying composition and to provide me with a focal point. I have not started on the painting yet so I will post some of the stages as I proceed, so that you can share the experience with me. This is a high risk strategy for my reputation and if it all goes horribly wrong you will, hopefully, be encouraged to take risks with your own painting. I will post the first stage soon. I wish my fellow competition entrants, Concetta Perôt, Alan Reed, Vandy Massey and Kim Dellow, good luck. This entry was posted in Jenny Keal Blog and tagged Cox & Kings, Cox & Kings Morocco Tours by Jenny Keal. Bookmark the permalink. Looking forward to seeing how you tackle this. Good to hear you’re well on the mend. Beautiful photograph with lovely cloud shadow. I’m sure you will do a great job. good to know you are feeling ok again Jenny…best of luck with the competition..looking forward to seeing the result…. So pleased to hear you are back in the saddle again. I look forward to seeing your picture full of wonderful colour. Great to see you and David at Great Bookham. So glad you are back to painting!! Thanks for the good wishes, Jenny. I think your pastels are stunning. I’m really excited about painting the Morocco picture – great challenge – and I am thrilled and honoured to be included in such an accomplished group of artists. Good luck to you too, and have fun. So sorry to hear. Glad to see you back in action!